We analysed the top technologies against a number of evaluation criteria and presented a breakdown on which tools are the best based on user need. The evaluation criteria included, security settings, mobile functionality, development time of dashboards, developer cost and availability, cost of technology, look and feel, and Microsoft Office integration. Our overall evaluation showed that Qlikview, Microsoft and Tableau performed the best. Qlikview took top position in our analysis followed closely by Tableau, although this was in large part due to technology cost. Tableau has a better front-end look and feel, but it doesn’t have the same breadth of ETL functionality. In close third place are the Microsoft products; Excel, PowerBI and Datazen. As the top ranking product, Qlikview has a number of strengths. Mobile functionality exists across all platforms; mobile website, iOS, Android, Windows Mobile, Blackberry and Browser Application. While it is quick to learn, users will need some training but there is a large online community and freely available online resources. User faces are intuitive and easy to follow. Qlikview supports a lot of customization options, including of existing dashboards and custom visualizations of published reports. It also offers automation of scheduled reports. Formulas follow similar logic as with Excel and dashboards can be designed using chart wizard and publish reports easily at the click of a button. As security is a major feature of this product, only users who have access to the actual files can edit them. The technology functionality is smooth looking and easy on the eyes. The response time when dealing with larger data sets is excellent and customization of calculated and derived fields is supported by scripting and dynamic creation. However, Clickstream data is not supported. Unlike the other products, Tableau has four main security features; Authentication security, Authorization security, Data security, and Network security, making it the most comprehensive and secure product among all tested. It only has mobile functionality with mobile website, iOS, Android, and Browser Application and the developer resources costs are above average, and not easily available on the market. That aside, interfaces are simple and intuitive, although users will need to do some training. There are fully customizable charts to suit client preferences. Export Excel data as csv and also PDF as well as automation of scheduled reports. Easy drag and drop interface means reports can be created on the fly with a built in ETL tool and creates appealing dashboards. In terms of technology functionality, it has built in ETL, but response times when dealing with large amounts of data is average. Customisation of calculated and derived fields is also possible. Simplicity of use, low development costs and the best look and feel are some of its most notable features. In fact, the Datazen product was considered the most visually appealing of all tools sampled. Its security features include utilizing existing Active Directory or ADFS infrastructure and also a default authentication mode. Hubs can be used to create member hubs and restrict access of users to specific dashboards. Mobile functionality is good with access through mobile website, iOS, Android, Windows Mobile and Browser Application (through the iFrame). Unique to Datazen is its ability to render all dashboards into HTML5 and all HTML5 data output can be embedded into the iFrame element. Datazen requires all data to be in presentation ready format. The tool does not allow any manipulation or formatting of data. Simple process to design dashboards and anyone experienced with charting data in Excel should find this product simple to use. The Datazen server is available at no extra cost to anyone who has a SQL Server Enterprise Edition with Software Assurance Alliance. Datazen Publisher and Viewer are available to download for free from the Microsoft store. 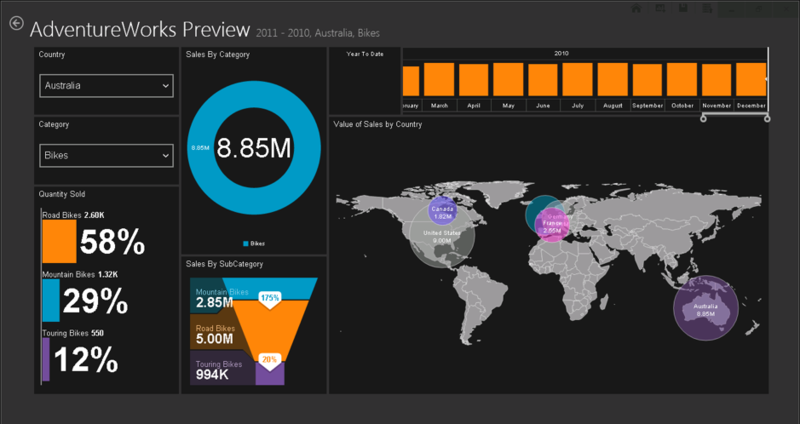 One of the newest players in this space, PowerBI comprises all of the previous features of Microsoft. It has an intuitive interface for users to view existing reports as well as create custom view of the data. Mobile functionality exists with iOS, Android and Windows Mobile. From a cost of technology perspective, PowerBI offers a free version, and also a Power BI PRO version which is paid for. 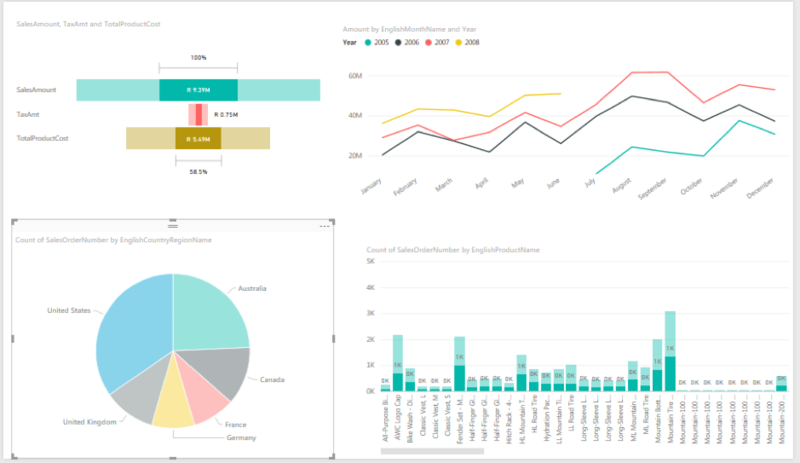 The PRO version enables customization of existing dashboards which can be created with the PowerBI desktop or cloud app. In terms of integration, PowerBI allows users to view files in Excel and files saved on SharePoint to be used in PowerBI, but export to PDF functionality is not supported. Although the current version only supports limited integration with Excel and not at all with Browser, Microsoft are working on making PowerBI embeddable. While its strengths are usability, interface and low costs, it has more to offer in terms of mobile functionality and office integration. Microsoft is continuously developing the product with feedback from users on features they would like to see. Often the tool of choice for casual BI users, Excel continues to hold its own in more complex feature analyses. Its ease of use, accessibility and Office integration creates good scores for development time and low technology costs. Mobile functionality includes iOS, Android, Windows Mobile and Blackberry. Development time is low and costs are within market average, with volume licensing options available for large enterprises. Users can freely create dashboards, however the appearance of dashboards are average and not very intuitive. It goes without saying the Office integration is seamless and export to PDF functionality is supported. But the technology functionality analysis shows that while, components are customizable, the performance is slow when Excel documents holds the data model in comparison to other BI tools. In summary, the top 5 products will most certainly provide you with the necessary tools. All of the products score well on user interface which is a measure of product development over recent years and product developers listening to user needs. Depending on user need, technology functionality, customization options, integration with Office, and level of security required will have a big impact on your choice, but we are confident that one of these 5 will meet your needs.